May your seas always be calm. Here's where I mounted the Webasto AT2000D diesel-fired forced-air furnace, and its simple controls. It's an older unit, and I bought it used on ebay. It's rated at about 6800 BTU's, and when cranked all the way up, it will run almost 16 hours on one gallon of fuel. In this picture, you can also see the insulated exhaust routed up through the shelves behind the heater, and one of the warm air vents mounted on the bulkhead. I modified a stainless bracket that I had floating around to hold it at an angle because it wouldn't fit horizontally with the big fuel tank in the way, and it's not supposed to be mounted vertically. I thought about mounting it in one of the side shelves, but I didn't want to lose the storage room. Plus, it would have been a real challenge to route the exhaust. ... and continues on to a warm air outlet in the starboard side bulkhead, just under the steering wheel. Each of the 4 warm air outlets can be opened or closed to put the heat where it's needed (usually that's some combination of heating the wife and/or the de-fogging the windows). 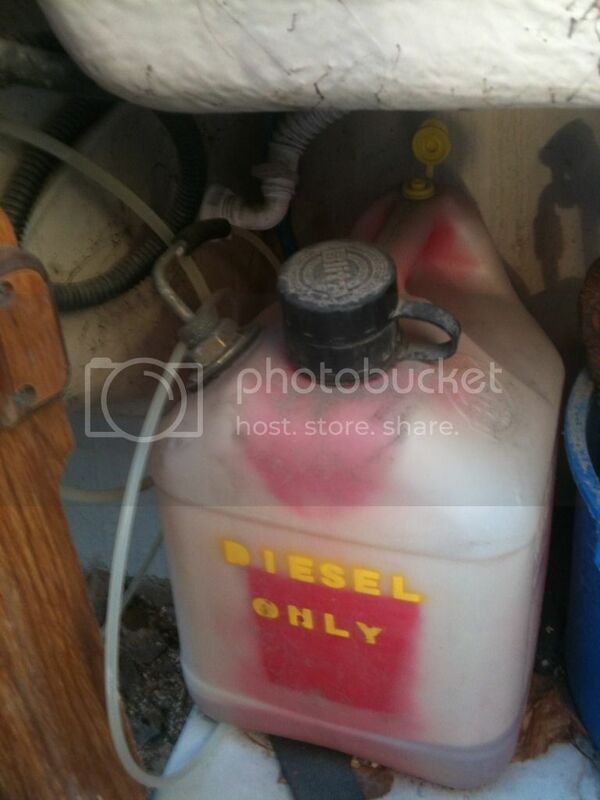 To fuel the system, I converted a small gas can into a diesel tank and mounted it in the port lazarrette. It's just cinched down with one of those straps that's typically used to secure a battery box. In this picture, the strap isn't secured. I recently had the tank out and hadn't put the strap back on yet. 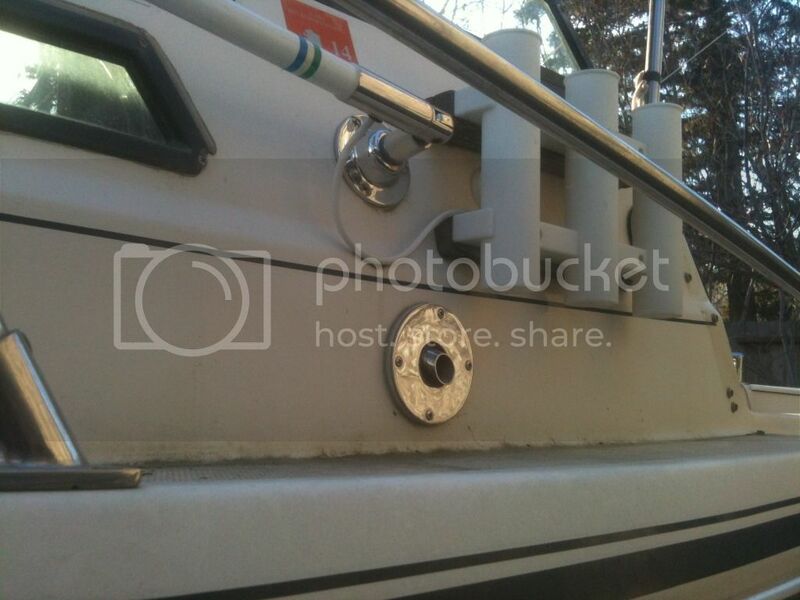 EDIT: Here's a shot of the exhaust through-hull fitting. Anyways, there you go. 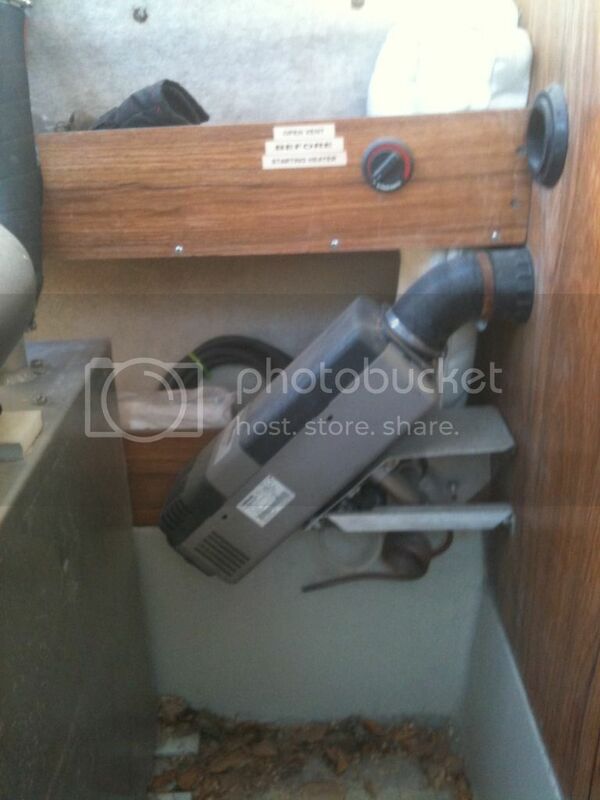 One fancy-schmancy super-awesome forced-air heater installed in a 17-foot Sea Ranger. It works great. The wife loves having the warm, dry air blowing on her, and I love being able to clear the fog from the windows. I've been giving some thought to installing a Wallas elec. heater. According to the manufacturers website thy draw on .9amps of current. In my case I ruled out the diesel because I already have to carry straight gas for the main and pre-mix for the kicker. There's no room to carry a 3rd type of fuel! They do make a gasoline version, but they don't come up on the used market very often. It looks like street price for a new gasoline kit is about $1100 [ebay link]. Comes with basic installation parts like fuel lines, fuel pump, exhaust duct, and controls. Would still need to add in a marine exhaust through-hull, insulation for the HOT exhaust duct, whatever warm air ducting/vents you want, and some kind of mounting bracket (could be fabbed pretty easily). A heater like this is certainly not cheap, but it's a great upgrade if you can swing it. Terry, you might want to re-check that info. Wallas makes diesel and paraffin fired heaters (mainly due to those being a lesser volatile fuel than gasoline) The current draw of 0.9 amps would be for the fuel pump and air fan. If it was an electrical heater at 0.9 amps and 12 volts (nominal) it would equal just over 10 watts... Maybe enough to keep your finger tip warm. Must havebeen the parafin one then Rick. I was looking for anything that would not require a 3rd type of fuel onboard. It seemed to fit the bill. I want to stop carrying propane and a big buddy heater...just to explosive and I worry about that. 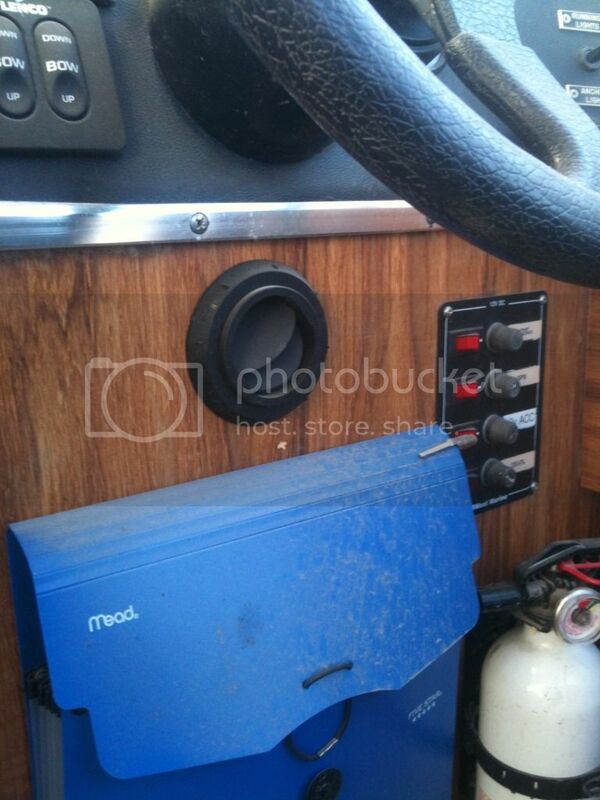 My dad has a small commercially built wood-burning stove in his sailboat. Burns little scraps of lumber or Presto Logs cut-into discs. Thank you for posting, looks like a great way to go. I really like the idea of dry heat and clear windows on most mornings heading out. Darn another project for the list. AK hope you're able to post the exhaust thru hull pics! Won't be tonight Mark. It was already dark by the time I remembered. FYI - sunset was at 4:27 pm today. Gotta love winter in Alaska. Can't figure out why no one ever mentions the Wallas 1300 heater? A little spendy but suppose to be quiet. The cook top Wryguy mentioned would be nice but no room for that on a 19. There's several manufacturers making diesel/kerosene fired forced air heaters these days (Wallas, Webasto, Espar/Eberspacher, Mikuni, and Snugger come to mind, and Toyotomi even used to make 'em, too). And, most manufacturers have several models with different levels of heat output - and different price points. I don't think there's anything necessarily wrong with the Wallas 1300 furnaces in particular, or with Wallas in general (I just installed a Wallas 30DT in my big boat). But, for the money, the Webasto AT2000 is hard to beat. It puts out greater than 50% more heat than the W-1300, and because they're used extensively in the trucking industry, you can usually pick up a used one for a lot less cash than a comparable new Wallas (case in point: search ebay for Webasto heater, and then search for Wallas heater... the difference in results is startling). Plus, the Wallas units are substantially bigger physically than most offerings from the other manufacturers (except maybe Toyotomi), so they are harder to find space for in a small boat. 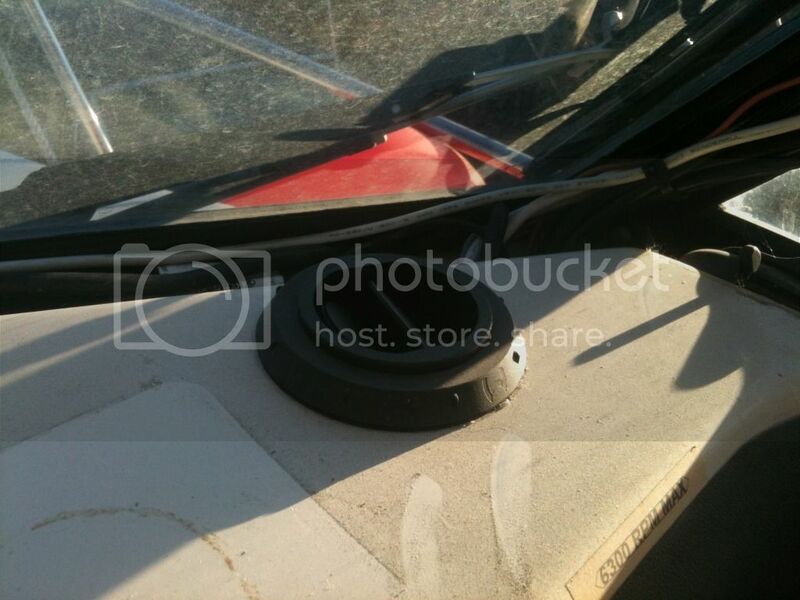 OK Mark, I added a pic of the exhaust through-hull to the original post. ... ummm ... my boat is a hardtop. But, I'm not sure that the top makes any difference in where the exhaust through-hull is. I angled it so that water has to travel forward and up before it can get into the system. Plus, there's a 'drain' in the lowest part of the exhaust pipe. But, the proof is in the pudding, I suppose. 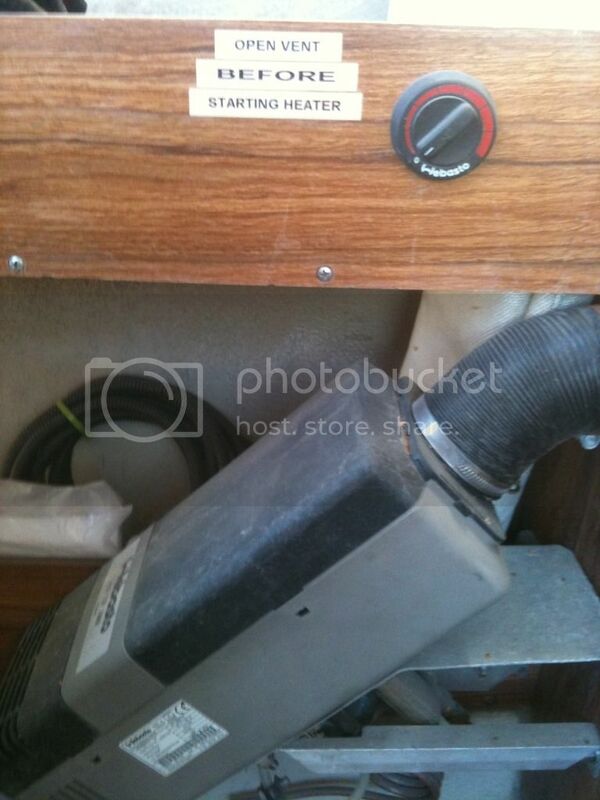 And, I don't believe that I've ever gotten any water through the exhaust into the heater. So, to answer your question... yes. I'd put it in the same location, no matter what top I had. Although, I thought it might be an issue with the rod holders right there. But so far, it hasn't been an issue. Nice set up. Since seeing your set up I have not stopped thinking about what you did. I contacted Webasto today and got some more information. Looking at your photos I have a couple of questions. 1: What is the coiled up copper looking pipe under your unit? 2: Why do you have that coiled up pipe above your unit in the storage area? It looks like extra fuel line. 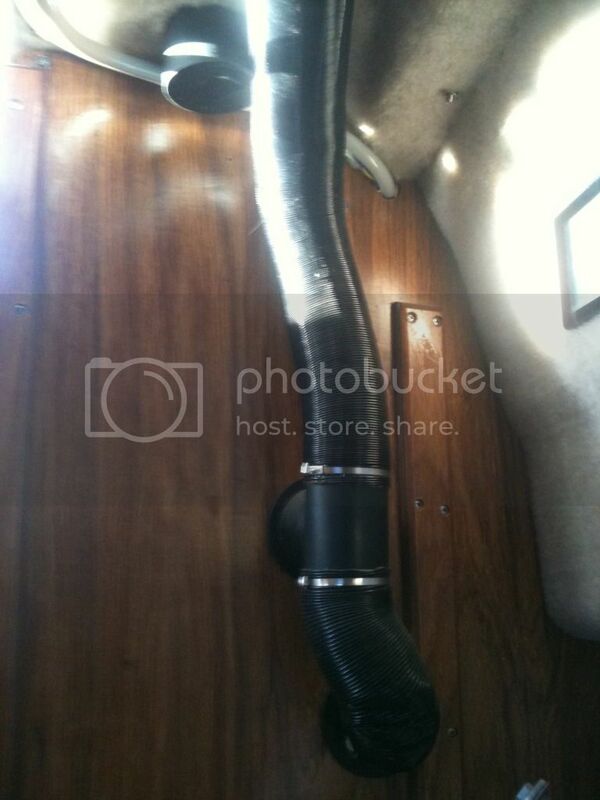 3: What did you use for ducting? That's a drain for the exhaust. Since the heater is below the exhaust through-hull, moisture could accumulate in the exhaust without it. The coils act like a p-trap, allowing somewhere for the moisture to go without venting exhaust into the cabin. And it doesn't really get hot, so I could add a hose to the end if I wanted to keep any drips out of the cabin. But it hasn't been an issue thus far. That's just 'extra' wire for the wiring harness (in split loom). It was my intention to cut it off and get rid of the extra length. 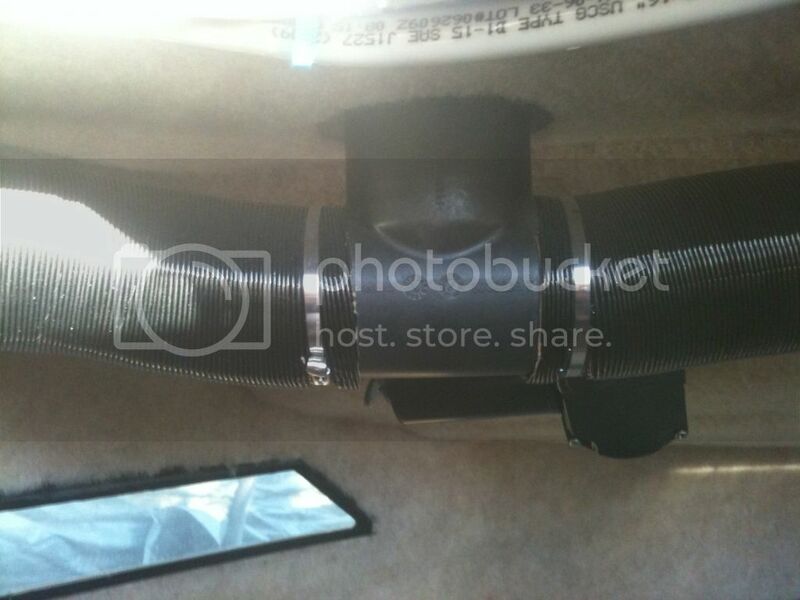 Just never got around to it..
i don't remember where I bought it (probably ebay), but the ducting is 55mm APK duct. It's a three layer structure - cardboard sandwiched between two layers of aluminum foil. If you can find the right size adapters, small diameter flexible dryer vent would probably work too. Spent this morning at the Pacific Marine Expo. That furnace is slick. The pictures don't do justice to just how small it is. Unfortunately my wife has purses bigger than that. That's a fact! The Wallas 30Dt I just installed in the big boat is probably 3-4 times bigger (physically) than that little Webasto AT2000, but it only puts out about 50% more heat, and costs twice as much! Is this a job you did yourself? How long did it take you to do the install? The thing that bothers me most is exhaust fumes getting windblown back into the cockpt enclosure. Any thoughts or perspective on that? SK - what exactly is it that bothers you?